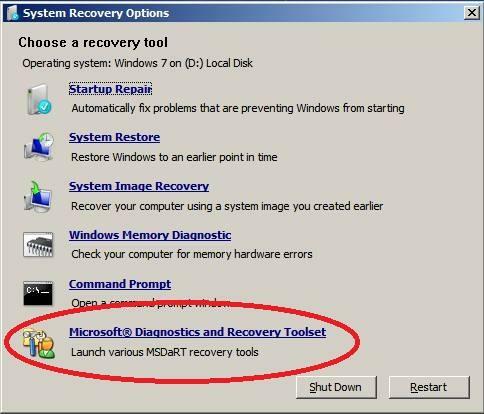 Microsoft Diagnostics and Recovery Toolset MSDaRT 5.0 for XP, MSDaRT 6.0 for Vista, and 6.5 for Windows 7 is a complete suite of powerful and versatile tools released by Microsoft (formerly Winternals) that allows you to repair unbootable or locked-out systems, restore lost data, and diagnose system and network issues while the system is safely offline. Use the following procedure to view and remove the programs that are configured to start automatically when your system starts. 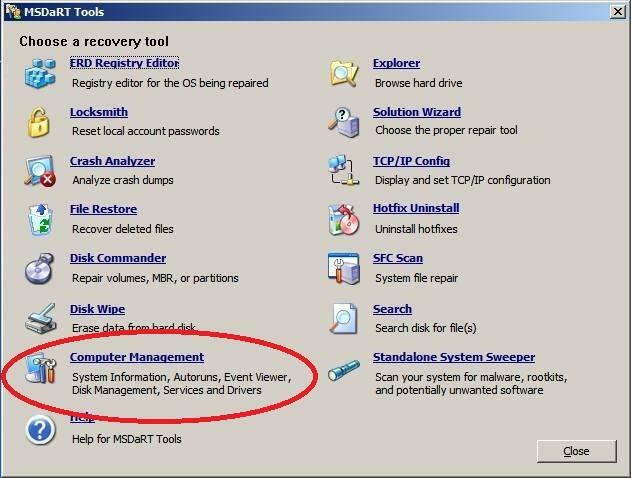 On the MSDaRT Tools menu, click Computer Management then click Autoruns. 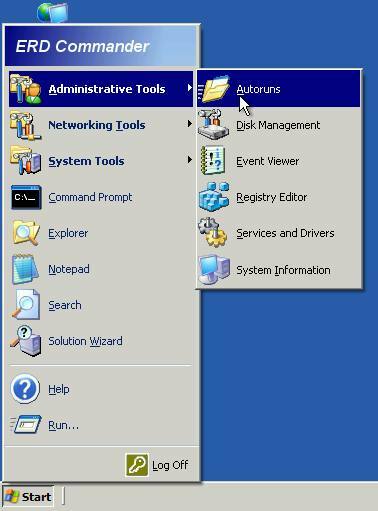 In the left pane, click System Administrator or any other autorun entry. The most important types of autoruns are listed in the right pane by default. Once you select an autorun entry you can obtain additional information by clicking View on the top menu and selecting the All Views drop down menu. 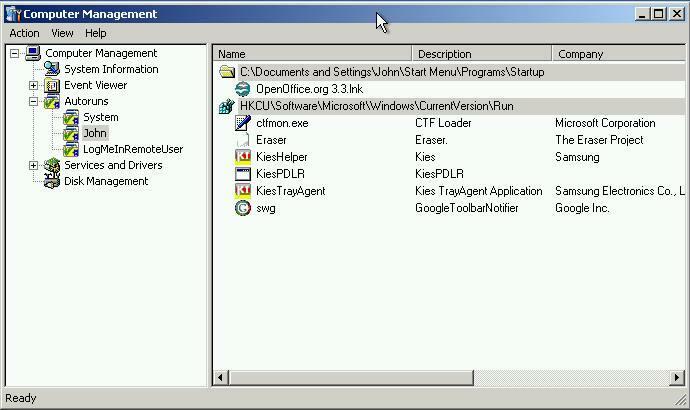 To remove a program, in the right pane, select the program to remove. On the Action menu, point to All Tasks, and then click Delete or Explore to remove or locate a program that is markedfor autorun. You can also right-click a program, and then click Delete or Explore. 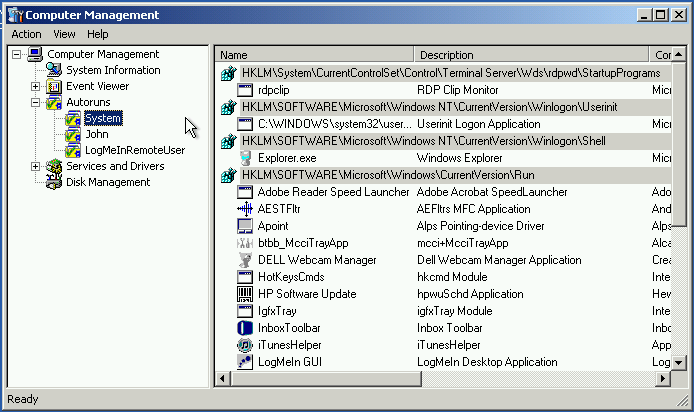 The Autoruns dialog displays user specific information based on the user profile. Establishing a user account on a computer does not automatically create a profile for that user. The profile is created the first time the user logs on to the computer. Therefore, for the Autoruns dialog to display user specific information, the user has to have logged on at least once.